​NeurATRIS is a National Infrastructure in Biology and Health that coordinates translational research in the neurosciences. Thanks to the complementarity of their expertise, platforms and knowledge, its members, all experts in biotherapy and neuroscience, contribute to strengthening exchanges between academic, clinical and industry research, to catalyze the emergence of key scientific and technological breakthroughs. Coordinated by Philippe Hantraye (François Jacob Institute of Biology/MIRCen, CEA), NeurATRIS brings together 6 research centers of scientific and technical excellence in translational research: the Frédéric Joliot Institute for Life Sciences , the François Jacob Institute of Biology, the Institut Hospitalo-Universitaire-Alzheimer-Institut du Cerveau et du Melle (IHU-A-ICM), the Bicêtre Hospital in Kremlin Bicêtre, the Institute of Rare Diseases Biotherapies (AFM-Telethon-Inserm) in Évry and the Henri Mondor Hospital in Créteil.  NeurATRIS is the French contribution to EATRIS, a European infrastructure for translational research. It represents a specialized component in neurosciences and neurology, as detailed by ESFRI, the European roadmap of research infrastructures. Research Team of the Institute involved in NeurATRIS belong to SHFJ and NeuroSpin. They are specialists in clinical and preclinical molecular and functional imaging.